I yam what I yam, and that’s all what I yam. It’s another filthy day here in Melbourne, and there’s a lot of doom & gloom going around. Which is why this is a post about yams – cheerful little New Zealand yams. And, in the south of the southern hemisphere, it’s time to plant them right about now. I’d only ever heard talk about these yams and had never laid eyes upon them, until my regular jaunt to CERES last weekend. Along with tumeric, rhubarb and other tubers, there they were, looking like pink ‘stubby wrinkled carrots’, amongst other things. And Stefan (ex-New Zealander) suddenly became decidedly prosaic. 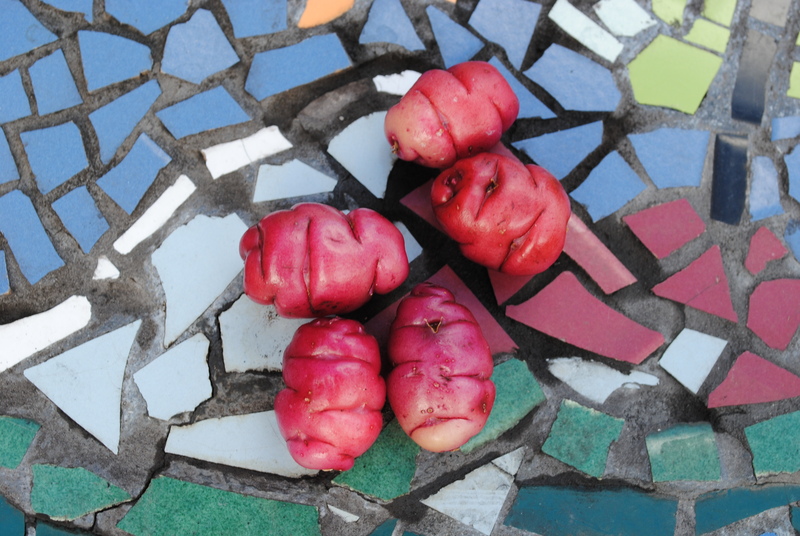 Oca, or New Zealand yams (Oxalis tuberosa). Now, given I’ve not had any experience with Oca before, this is an adventure into the unknown. I’ve been told, by said ex-New Zealander, that they are delicious – nutty tasting and a bit like a potato in texture. Often eaten raw, sprinkled with salt, lemon and hot pepper, Oca can also be cooked or pickled. According to the info sheet that CERES provides, in the Andes, the yams are left in the sun for a few days, to sweeten their taste. NZ yams are pretty hardy but shouldn’t be grown in subtropical or tropical climates. They also don’t like a frost, which is why I haven’t got around to planting them yet, as who knows what weather we’ve got ahead. I have the perfect spot picked out for them, I’m just waiting on some more than fitful sun to warm the soil a bit, and I figure they don’t like too much water. 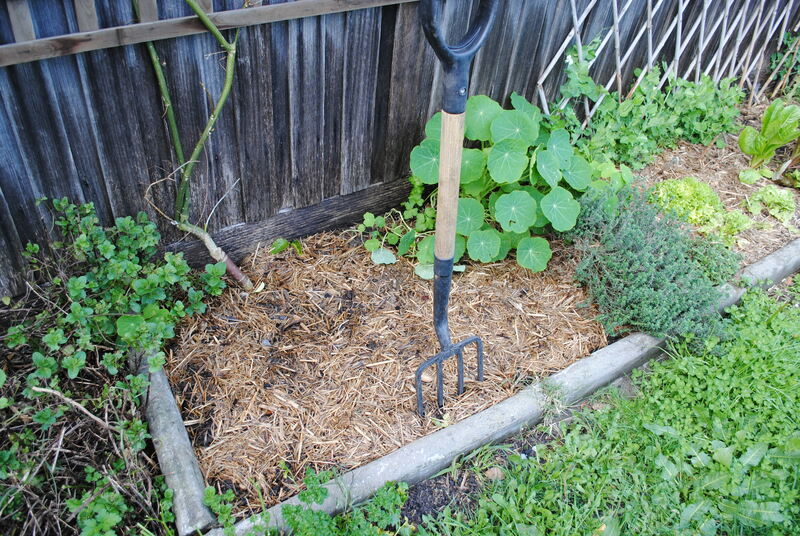 The NZ yams’ spot in the garden – gets sun in the mornings all winter, more in spring, and not too much in summer (and their roots won’t interfere with the passionfruit). So, you plant them just like potatoes, about 5cm in depth and 30cm apart, mounding them as the foliage appears to encourage more tubers to develop. After about four months, you dig them up, presumably keeping some for replanting the following year. The foliage can also be eaten, and tastes a bit like sorrel. Oca seem like perfect post-apocalyptic food. If we’re okay until after the next four months at least, then I might get a chance to fill you in, and run some recipes past you. if you’ve got a warm spot in your garden, perhaps give them a try and let me know how they go (northern hemisphereans will have to wait a while for this challenge). If you’ve got this far you’re probably wondering about the Popeye connection, apart from the obvious pun. Well, Popeye’s commitment to being himself and nothing more is related to embracing your inner dag, the connection of which to gardening is explained in that post. And for me, there is a connection of this to Voltaire, and thus to Confucius, which then brings me full circle to Charmian Clift. But that’s just the way my head works, particularly when it’s feeling overburdened with the planet’s woes.